This year, Mila celebrated Halloween in France wearing the Batgirl costume I had put in her suitcase amongst other things. So I don’t have photos to share but I realized that I never posted the photos of her Moustache Birthay party! Initially, it was supposed to be an Ugly Betty party but it turned out that she was the only little girl to watch Ugly Betty with her mum and none of her friends knew who Betty was so we settled for a Mr Mustache one. We put some smarties in little paper boats, some pretty straws in the Owl Vase, a lovely Rob Ryan bunting and lots of white balloons in our lounge. I made some delicious chocolate brownies, the girls played games, danced, jumped on my sofa, sometimes the moustache fell off but everybody had a great time! Love the 1rst pic!!!!! excellente idée…j’adore!!!! Love, love, love the straws in the owl – and how sweet are all the balloons on the floor? So fun! 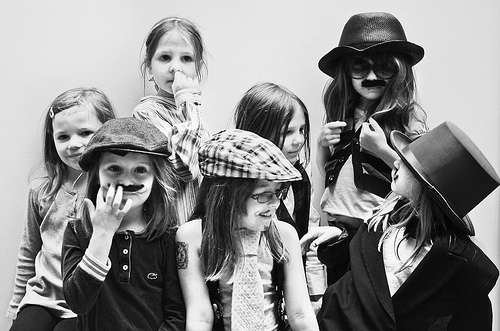 This party looks simple, silly and sweet– all the things that a child’s party should be. Well done! what a gorgeous party! and loving your photo wall. These pics are absolutely adorable. I am hosting a mustache themed link party this week. I’d love for you to link this up!